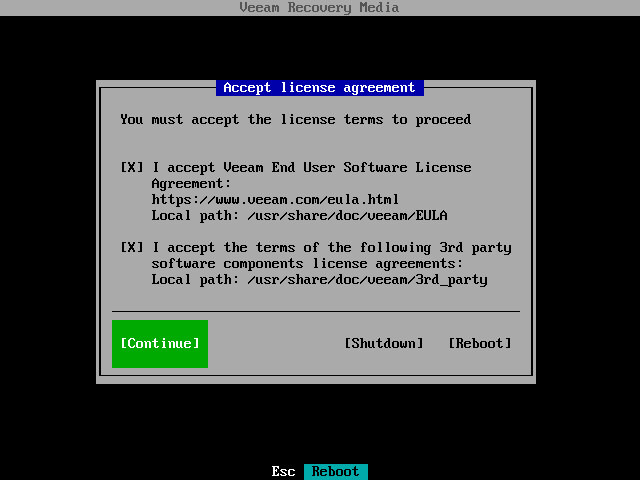 Wait for Veeam Agent for Linux to load files from the Veeam Recovery Media. Make sure that the I accept Veeam End User Software License Agreement option is selected and press Space. Select the I accept the terms of the following 3rd party software components license agreements option with the Tab key and press Space. Switch to the Continue button with the Tab key and press Enter. Make sure that network settings are specified correctly and configure the network adapter if necessary. To learn more, see Configure Network Settings. Restore volumes — the Veeam Recovery wizard to recover data on the original computer or perform bare-metal recovery. Restore files — the File Level Restore wizard to restore files and folders to the original location or to a new location. Switch to command line — Linux shell prompt with standard utilities to diagnose problems and fix errors. 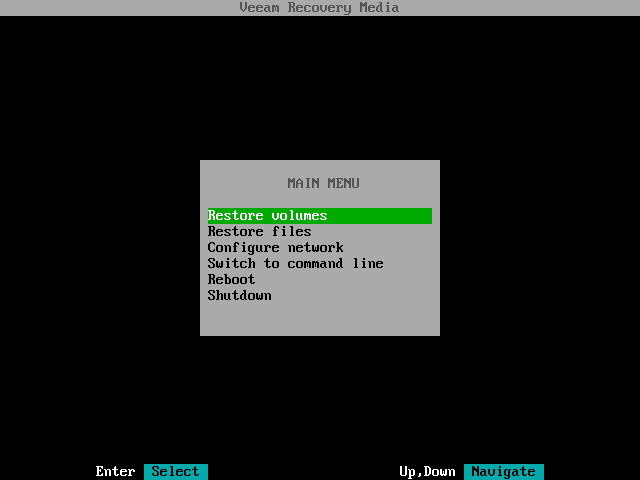 To stop working with the Veeam Recovery Media and shut down or restart your computer, in the Veeam Recovery Media main menu, select the Reboot or Shutdown option and press Enter.